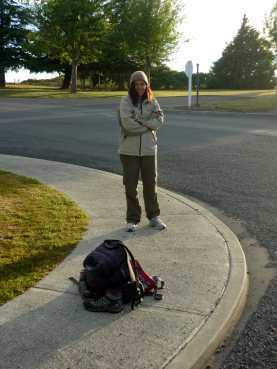 On the 21st of December 2012, precisely on the day the Mayans predicted the world would end, we walked off our accommodation in Te Anau, Southern New Zealand, at 7 am in the morning to find a completely desolate town. It was a beautiful, crisp morning but there was no one in sight. For a moment, we could not help but wonder: was my sweet little daughter right? 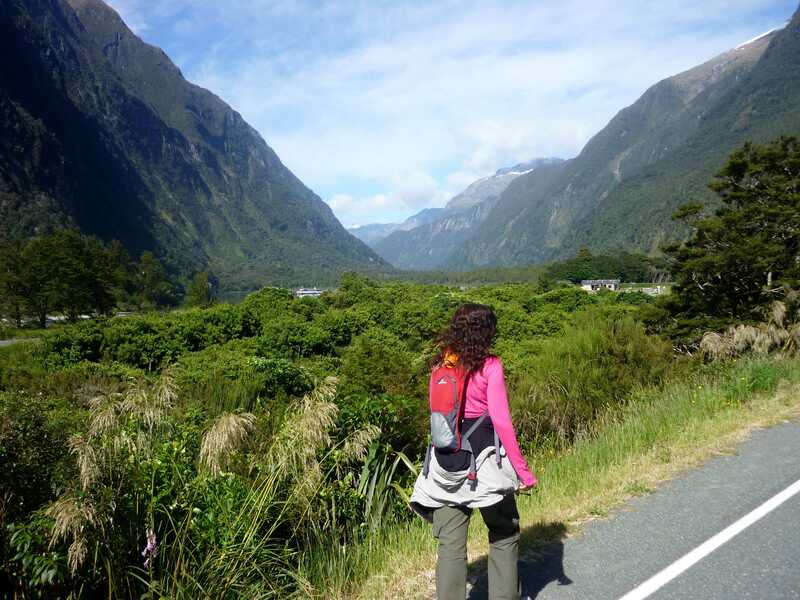 She insisted we should not be in a remote mountainous location in Southern New Zealand on that day because if the world truly came to a stand still we would have no way to connect with the rest of the inhabitants of this doomed planet and it will be impossible to get back to Australia? No way, the Mayan apocalypse was just the dawn of an era for them, it had nothing to do with the rest of us. And yet there were no cars, no noises, no life. We were supposed to be picked up by the local bus to drive us to Milford Sound at 7 am. It was 7.15 and the bus was nowhere to be seen. We looked at each other in disbelief. 7.20 – nothing. Ok, now, this is too creepy. 7.25 and in the distance an object is moving. It slowly approaches us, and yes, it does look like our transport. Phwww, the world as we know it seems to keep on turning (more or less). A smiley man in his fifties, white hair, white moustache, big blue eyes, harsh skin gets off the driver´s seat, comes towards us, shakes our hand and I say, ¨I thought you´d forgotten us¨, to which he replies, ¨nahhh¨. He smiles, asks us to jump on board and starts driving at what seemed to be a vertiginous speed. Well, we thought, if the Mayans did not put an end to us, this lovely New Zealander very well might. 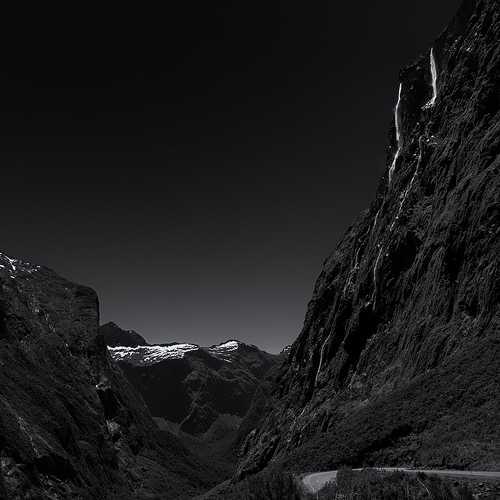 until reaching the Homer Tunel, the 1.2km long road tunnel opened in 1954 to link Milford Sound to Te Anau and Queenstown. 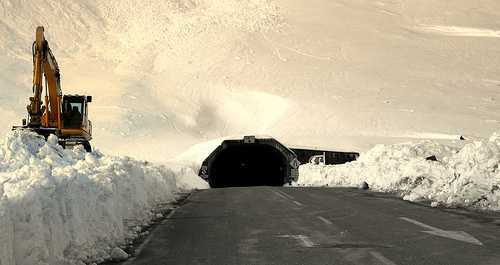 This unforgetable experience suddenly emerges before you, a simple dug out hole leading onto a single-lane road that runs for 1270 m in near complete darkness. Not the place for someone who suffers from claustrophobia. But believe me, driving through the Homer tunel is worth the trauma. 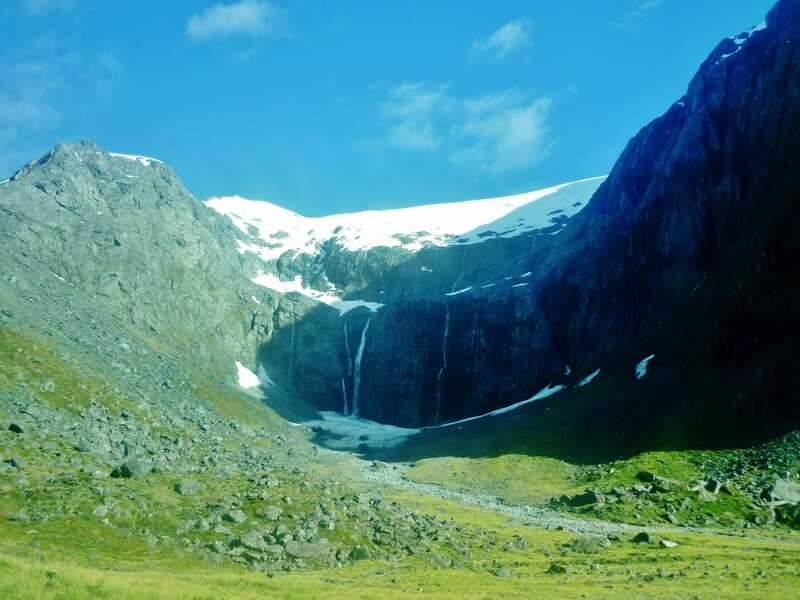 As soon as you leave the guts of the Darran mountain range, you regain your breath and open your eyes, the Cleddau river valley surprises you with impossibly vertical peaks drizzled with capricious, vanishing waterfalls. The rest can barely be justly described with words, images do a much better job but still fall short. 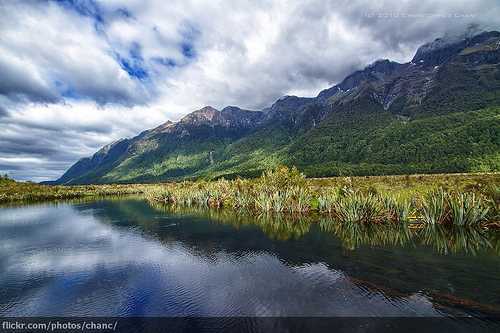 The outstanding job that mother nature did in Milford Sound does not need any further recommendations. Every single second you spend in this privileged part of the world will have you jaw-dropping. 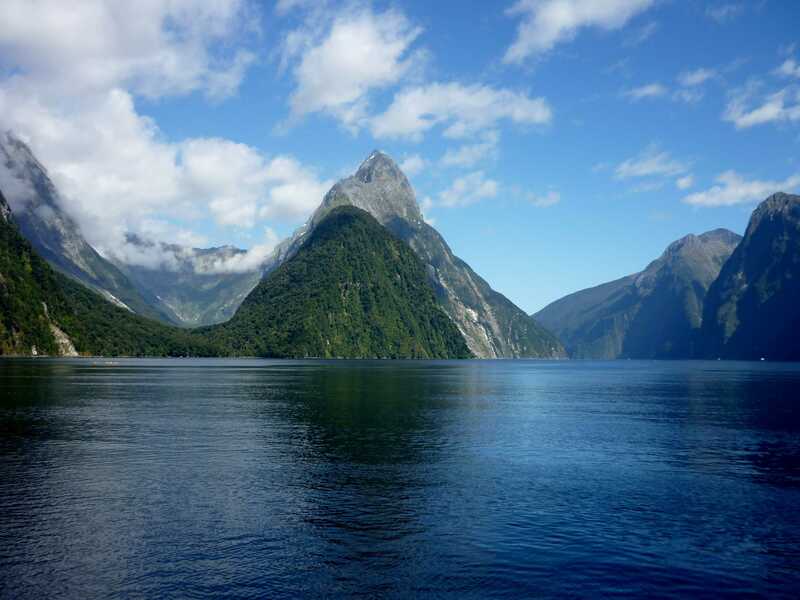 But apart from the natural sceenery, there was one other thing that stood up for us in Milford Sound – the people. Robert got us to the passenger terminal in time for our Milford boat experience. He helped us with our backpacks, and chatted to us about his life as a fisherman and his many trips to the other well-known Sound, the Doubtful Sound (but that´s another story I need to tell). We fell somewhat sad leaving this ruggedly sweet southerner behind but walked into the terminal to get our tickets sorted out. And then, the magic of the Milford community began unfolding. A lovely Malaysian young man helped us with everything and in no time, we were ready to jump on board. We talked to him and asked him about living in the sound, what life was like here, in such a remote part of the world, where there is barely any Internet and mobile phone connectivity. He explained he had been here for nearly four years and loved every single minute of it and that what made it such a remarkable place to be was its beauty but above all else, its community – the Milford Sound community of young travellers that choose to remain isolated from the rest of us and enjoy each other, the visitors and nature for a few years of their lives. After navigating through the waters of the sound for three hours we made our way to theMilford Sound lodge and there, the magic continued. We were greeted by a smiley swedish young man who sorted all our accomodations details very merrily and efficiently and, in finding out we were from Barcelona he mentioned that two of the lodge´s employees were also from the peninsula. After having a rest in our room, we went back to the reception only to find Paco and Nicolás, two very helpful, jovial spaniards. They explained they had been in Milford for quite a number of seasons already and that even if they chose to move elsewhere, they always seemed to find their way back to this outstanding place. And somehow, and despite the aparent loneliness of this remote spot in this remote country, we understood what they meant. Milford offers to these young travellers a perfect combination of a stress-free, simple life; a privileged work environment; contact with people from around the world who arrive to the Sound every day happy to be there; a community that choses to leave everything behind and experience what this far-flung, untarnished world has to offer; and above all, a superb display by mother nature when they open their eyes every single day. Next Next post: Should we not leave the final Antarctic frontier alone?